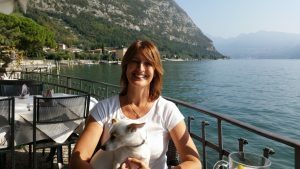 She was talking about Lake Iseo (the Lady had bought a half-ruined palazzo in Lovere, acquired a dairy and then set about introducing locals to what she called ‘the science of butter-making’). We all know that Italy is famous for it’s art and artists have been fascinated by the Lake. This year it was Christo who chose it as the ultimate location for his Floating Piers. But already 500 years ago no other than Leonardo da Vinci visited the lake and was captivated by mount Trentapassi (1248 m high, located between Marone and Pisogne). It is believed that the mountain features on both the Mona Lisa and the Annunciation, even on several other of his paintings. So what is it that I enjoy most when I am at the Lake? It already starts with the drive from Orio al Serio airport. The road to our apartment takes us via Lago Endine, a very quiet and peaceful lake next to Lake Iseo. Then it leads uphill where we suddenly come face to face with the magnificent Trentapassi, “our mountain”. We then turn right to our local supermarket where the people are always friendly, even though our Italian is limited. Our apartment feels like home to the whole family. The views are magical and on the first evening we head straight to our favorite pizzeria. Where the tasty big pizza’s cost around 6 euro and the freshly made gnocchi with either cheese or shrimps is just delicious. The wine list spoils you for choice and if we don’t drink the whole bottle, we take it with us and enjoy the rest on our terrace. Before returning home we stop for a huge ice cream at the local gelateria. There really are many great restaurants around the lake and I often still cannot believe how reasonable the prices are. Another must on our agenda is clothes shopping at Franciacorta outlet, between Iseo and Brescia. It is here that I get my fix for affordable Italian fashion. And if I cannot find what I am looking for there, I will try the boutiques in Iseo, Sarnico or Lovere! But what makes the lakes truly attractive is their nature, and how to enjoy that. Hikers will find many paths to wander. Cyclists have long discovered the challenging beauty of the winding roads around the lakes. In Franciacorta you will find besides high quality wine, a wonderful 18-holes golf course. And last but not least, get a different perspective from the water and rent a (sail)boat. Even skiing in winter is an option: not many people know that within 45 minutes you can be on skis in the resorts of Montecampione or Castione della Presolana. Life in Italy, endless things to enjoy. But right now, I wish I was there just for a cappuccino and a brioche!